You go down to the supermarket, you’re in the dairy aisle and want milk, it says Llaeth Cymreig so your happy. What you are probably unaware of, is that your Welsh milk started here in West Wales, travelled to Bridgwater or London for bottling, went to a distribution centre and then returned to West Wales. Does it matter? Yes, the economic benefits of adding value to the raw milk have been lost to England. They get the jobs, the money that gets spent locally, the money that goes into local tradesmen and suppliers. Then to add insult to injury we get the environmental cost. Millions of litres of raw milk leave Wales by lorry every week, adding to congestion on the M4 and damaging our environment. 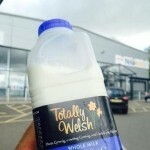 Here at Totally Welsh we are about adding the value to Welsh milk here in Wales and getting the economic benefits for the Welsh economy, as well as reducing food miles. DON’T BUY WELSH, BUY TOTALLY WELSH!